I’m currently busy preparing & thus it might be abit difficult to keep this blog’s promise of ‘a painting a week’ (if I hadn’t spent so much time chatting away to myself here in the deafening silence of this blog, then I could have painted a stock of ‘a painting a week’ & then published them at my leisure & thus you all could have said ‘incredible! Not only does he teach but he also paints & writes long, confusing, wordy posts at the same time’). A painting workshop is a lot of fun. If you like painting, meeting people & learning as well as the excitement of travelling & being in a new place, then a painting workshop is for you. New places can inspire your creativity. I think one of the reasons why artists take on the challenge of painting new places is that travel ‘defamilarises’ (actually we have a 30 % student return rate, so for some it’s not a new venue. One person is coming back for the fourth time). To see with fresh vision … new places… I thought the notan photograph in the previous post had a little of this quality of unfamilarity. 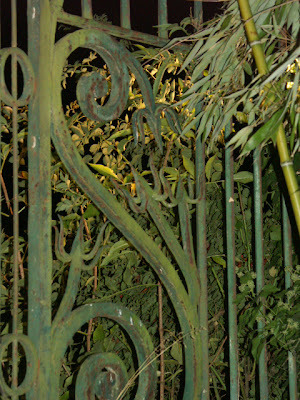 So as to give a more complete picture, I now post another snap of the gates of Chateau de Lanquais.